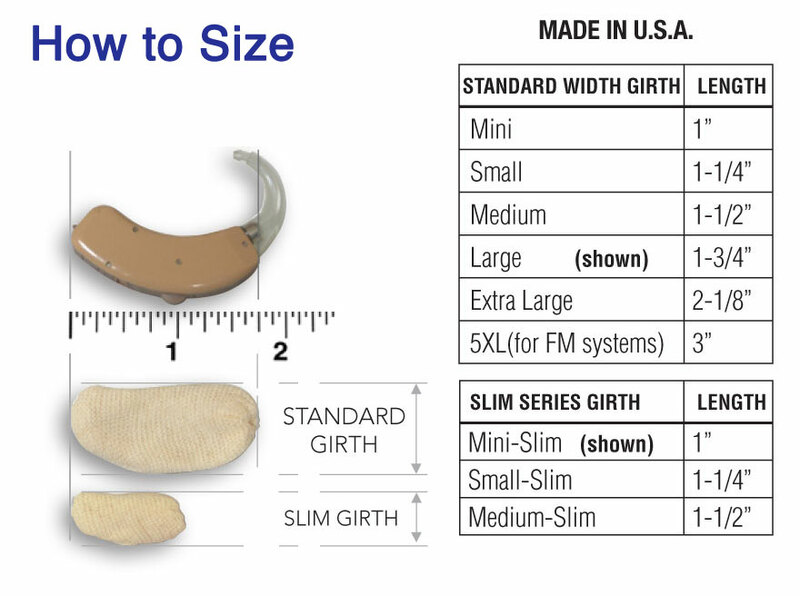 -- Please Choose an Option --	Mini 1" Small 1-1/4" Medium 1-1/2" Large 1-3/4" Extra Large 2-1/8" 5XL (for FM systems) 3" Mini-Slim 1" Small-Slim 1-1/4" Medium-Slim 1-1/2"
The ORIGINAL Hearing Aid Sweat Band™ is made from a specially designed, all-natural fabric that sheds moisture while protecting your hearing aid from the damaging effects of dust & dirt. Our Hearing Aid Sweat Band enables the wearer to leave their hearing aid in place, not only during high-perspiration sport activities, but anytime to protect and defend against moisture, dust and dirt. The ORIGINAL Hearing Aid Sweat Band™ is available in 9 sizes and 17 colors for all makes and models of BTE devices. Our Hearing Aid Sweat Band™ is the only such product that is proudly made in the USA. Our product is comprised of a comfortable all-natural fabric that is proven to protect the wearer's hearing aid from moisture. Our Hearing Aid Sweat Band™ is conveniently packaged with two (2) per pack, and is available in seventeen colors and nine sizes ranging from Small to 5XL for FM Systems. Plus, our “Slim Series” keeps pace with the new smaller, behind the ear open fit aids that are on the market. 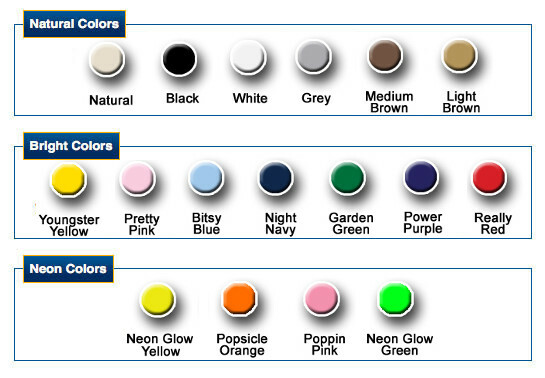 Still can't choose a Color? Click here for more examples of these Colors. Protect your hearing aid from the damaging effects of moisture, dust and dirt with the Hearing Aid Sweat Band. I bought my first pair and they worked well to protect my expensive hearing aids. So I bought a second. I was very skecitial when I placed the order that would really work. Once they arrived I was amazed. I also did the water test and the paper towel was dry . I use them everyday, they are just awesome out in the good ole winter days in the wind. Thank you ! What a simply outstanding idea. So simple it works and works well. Here in Australia Hearing Aid Sweat Bands give protection against wind,dust, rain and on very hot summer days protection from sweat entering the battery compartment and causing the hearing aid to fail. I have been using them for several years now and they solved my problem and lowered the stress level that occurred when my hearing aid failed especially in my situtation from body sweat. Great to save on repairs to the hearing aids. I stopped playing hockey 4 years ago and started running deaf because my hearing aids would always conk out and it was always time consuming and costly to send in for repairs. I wish I had known about this product earlier! When i was a kid there were these plastic rubber-like old school bands that I felt never worked well. I played hockey again yesterday using this product and my hearing aids did not once die or show any sign of sweat. By far the best protection and worth the investment. At Last Something That Works! I sweat very profusely even in cold weather and I have had to have several pairs of hearing aids replaced over the last five years due to sweat damage. I tried another product that was made of spandex but all that happened when I used them was that at the end of the day the spandex covers were full of moisture and had held the moisture against my hearing aid which was also wet with moisture. Not so with these Hearing Aid Sweatbands. I take them off at the end of a particularly sweaty day and remove my aids from the sweatbands and the aids are virtually bone dry. I am now looking forward to not having to return to my Audiologist every five minutes for yet another replacement unit. Before getting my hearing aid sweat bands I could not go out in the Florida or Texas summer heat to work or play due to humidity. My hearing aids would need to be serviced to remove the moisture. As I wear my aids all day, I needed a solution. The sweat bands stopped the moisture and protected by aids. I would highly recommend them to resolve moisture issues for hearing aids. Also the service department is top notch in resolving any issues encountered. Thanks! These sweat bands do the trick. I was given my first set of sweat bands by my doctor. When it came time to re-order, I purchased a smaller size, since they were too big. This current order is for an even smaller size which I am hoping will work even better. They work as advertised - my hearing aids used to short out during tennis, and it became difficult to communicate with the other player(s). Wearing these sweat bands eliminated this problem.